This recipe legitimately haunts my dreams. And not in an 'oh no, I ate too much cheese before bed and now the cheese is chasing me in a nightmare' kind of way, more like a waking up with a lil patch of drool kind of way. Cute, I know. Garlic bread is possibly one of the best foods out there. For reals. Whoever thought of putting garlic and butter together and smothering it on warm bread needs some kind of medal. And a hug. 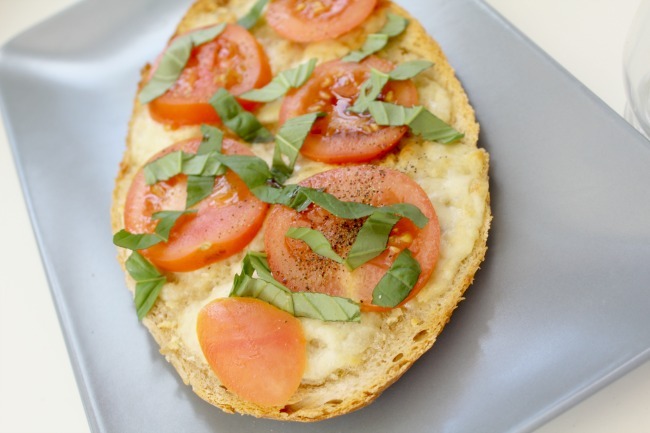 This caprese garlic bread is possibly the best way to make garlic bread that I've ever tried. I've tried a lot of garlic bread in my life as well, just FYI. 1.) Mince the garlic and combine it with the butter. We use 5 or 6 tablespoons to make sure there's enough for a good coating. 2.) Cut the ciabatta loaf in half horizontally. Butter the two halves. 3.) Cut the mozzarella ball into thin slices. Place on the loaf and pop under the grill for 15 minutes. 4.) Whilst this is grilling, chop the tomatoes and basil into thin slices. 5.) Pop the bread out of the grill, and place the tomato and basil on top of the mozzarella. 6.) As a finishing touch, drizzle some balsamic vinegar over the top, and season with salt and pepper. It look so good, I mean, who doesn't love garlic bread! Garlic bread is the best, isn't it?! I love garlic bread and this is so easy to make! Oh my god Steph these looks amazing. Garlic bread is literally life. I will have to make these at the weekend. MMmmmmmm. Garlic bread IS life aha. I can't get enough. I hope you get round to giving them a go! This looks like my perfect lunch. Italian food for the win!